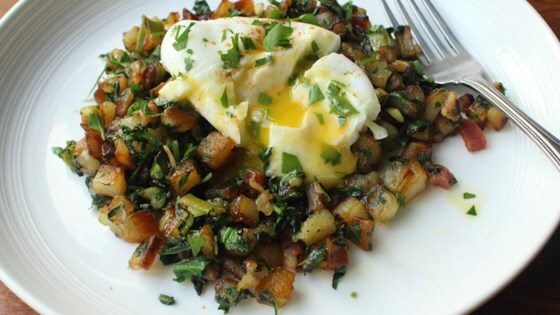 "This potato, spring onion and kale dish makes a beautiful and delicious base for poached eggs. You can even add leftover chopped corned beef." Place diced potatoes to a bowl of cold water. Drain. Rinse again in a fresh bowl of cold water. Continue rinsing in fresh water until potato starch has been removed and water remains clear, about 3 rinsings. Drain well. Heat oil in a skillet over medium heat. Add pancetta and cook and stir until crisp, about 5 minutes. Remove pancetta from skillet with a slotted spoon; drain. Reserve oil. Cook potatoes in reserved oil in skillet over medium-high heat. Brown in one even layer until pieces are browned and crusted on the bottom. Stir; spread potatoes in a single layer again and brown. Repeat until potatoes are golden brown on all sides, about 8 minutes. Add butter and chopped green onions; cook and stir until onions have sweetened and softened up a bit, 3 to 4 minutes. Add reserved pancetta. Stir in chopped kale and cook until kale wilts. Add grated cheese; cook and stir briefly. Serve topped with a poached egg. Sprinkle with a pinch of cayenne pepper and chopped parsley. Your new favorite Irish breakfast.